"Frank Smith, 6 feet 1 inch tall, weighs 179 pounds and won all sorts of honors in four sports for East Chester High in Tuckahoe, N.Y. He starred as a freshman and was a first stringer in 1948, but was out of school in 1949. 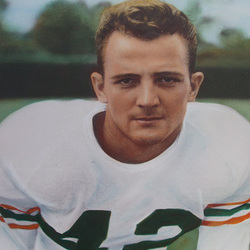 Back in school in 1950, Frank was headed for All American consideration when, after scoring 10 touchdowns in Miami's first five games and running such teams as Purdue and Pittsburgh ragged, he received a shoulder injury. Not until he came back to score twice against Clemson in the Orange Bowl game did he regain his early season brilliance. At that, Smith gained 530 yards for Miami in part-time service, a figure topped only twice by Eddie Dunn and once--by two yards--by Jim Dooley. He caught 15 forward passes and in general was a standout. This year, his running should be even more elusive and he may also take on some punting duties as he was kicking brilliantly in the spring drills. If he escapes injury, Smith will have to be given plenty of consideration in selecting the 1951 All American teams." Frank Smith had an outstanding 1951 season, leading the Hurricanes to an 8-3 record and a Gator Bowl victory over Clemson. Smith led the team with 9 touchdowns scored (54 points), rushing (764 yards on 144 carries), total offense (824 total yards) and punt returns (12 for 223 yards for an 18.6 yard avg.) He also caught 9 passes for 161 yards and a touchdown. He left Miami holding school records in for Most Yards Rushing, Season (764 in 144 tries, 1951), Touchdown Passes Caught, Season (5 in 1950), Most Yards Rushing, Single Game (182 in 15 carries Vs. Chattanooga, 1951), and Longest "Forward Pass Play" in a Game, (81 Yards to Al Hudson Vs. Georgia, 1948). He was also 2nd in career rushing yards (1666 in 325 attempts) and 2nd in career touchdowns scored (22). both trailing only Eddie Dunn. All school records have since been topped.